In physics, you can use torque to solve rotational motion problems. For example, you can calculate how much torque is produced by opening a jar of pickles. Torque always points in the direction of what other quantity? How much torque is produced by opening a jar of pickles if the lid on the jar has a radius of 3.8 centimeters and the force exerted tangentially to the lid is 150 newtons? Assume that the force is concentrated at one point on the lid. Round your answer to the nearest tenth of a newton-meter. 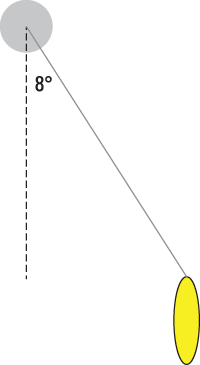 A 78-gram pendulum swings in a clock, never swinging past an angle of 8 degrees with the vertical. If the pendulum swings on a 2.8-meter-long string attached to a pivot, what is the maximum amount of torque about the pivot? 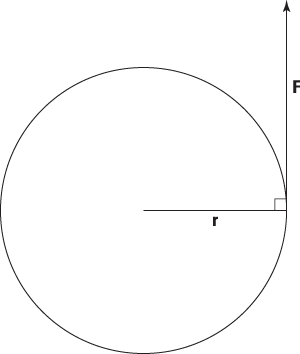 Round your answer to the nearest tenth of a newton-meter. Just as force always points in the same direction as linear acceleration, torque points in the same direction as angular acceleration.